Today I attended the the Open House at the local National Weather Service office which serves most of the forecast area for eastern PA and NJ. 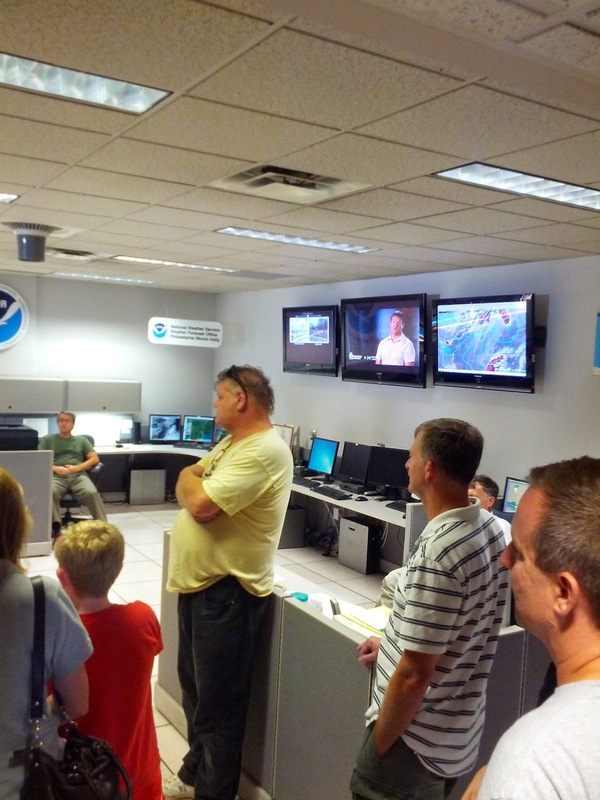 The event allowed the public to meet the staff and meteorologists that help us by issuing the weather warnings, that help keep us safe 24 hours a day. I met the two Meteorologists there that taught the two Skywarn classes that I attended in the past. I made sure I thanked them since I know they do not receive enough credit for their intensive and dedicated work that they do. Ahead of me was a mother and son taking to Joe Miketta (one of the Meteorologists) and the question asked was; "what do you do to study and become a Meteorologist to work here?" Joe's answer was interesting. He stated that he did not want to give an unrealistic picture of the job working at the NWS. He stated that the meteorologists that work there do not make that much and at the same time did not want to discourage a young person to pursue a career however he was just being honest. There appears to not be that many available jobs in the field which would mean that should be competition on open positions. He also mentioned an internship program and made a few suggestions about sources for information for study. I looked around the forecast office and saw multiple computer screens across a wide workstation area with large screens on the wall to help monitor live TV, radar and satellite images. This was certainly the place I have wanted to visit. Everyone I spoke to was eager to share information about their work which was a good educational experience. I hope they continue to offer these events in the future so that I can take my children since they have a presentation which shows the basics on forecasting the weather and how they monitor and issue watches an warnings for the forecast area that they are specifically responsible for. If you want an educational family event to do next year, please keep this in mind. A big "Thank you" to The National Weather Service office in Mt. Holly NJ for hosting this event.